No, we don't usually give them away. However, there are ways of getting these great scoreboards without cost to your organization. The key: sponsor advertising. You are probably already familiar with the concept of team sponsorship. A local (or national) merchant will sponsor a team to gain community goodwill and get name recognition through advertising. So how do you get your ScoreTronics scoreboard without cost to your organization? Scoreboard sponsorships! ScoreTronics scoreboards can be ordered with an optional hinged sponsor panel that can display an advertiser's message. You can sell yearly advertising sponsorships (which will continue to generate revenue long after your scoreboard has been paid for). 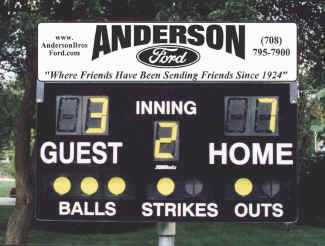 Or, a merchant can purchase your scoreboard directly and donate it in exchange for permanent or multi-year advertising. The low cost of a ScoreTronics scoreboard is often well within the reach of your local merchants. Because the unit is taken down at the end of the day, scoreboard advertising is often possible where permanent advertising is not allowed. Contact your sponsors and let them know about the opportunities available in scoreboard advertising and sponsorship. Your scoreboard could be just a call away!